It’s tempting in this time of New Year’s resolutions, to start doing a postmortem on our annual productivity. We love the end of the year for that very reason. We enjoy setting goals and assessing our progress. However, it’s easy to start viewing ourselves as just a series of personal and professional milestones. This past year has been challenging, but there have been so many pleasures, large and small. We wanted to take a few moments to remind you all that you are more than your work, and so are we! At Smorgasburg LA with family eating all the vegan food. If you are interested in what two #actuallivingscientists did in 2018 to support their emotional and mental well-being, read on! idea how to wear their cap. Well guys, I made it. One bedroom apartment. State College, Pennsylvania. In the five years since living with Rachel and Friends during our undergrad Wonder Years, I haven’t exactly had the best of luck with housing situations. Granted, living in the Chestnut Castle with my best friends really, really set the bar extra high. Not to say that I’ve suffered through completely horrendous slum lord conditions with outrageous rent prices, but after spending half the time living with my parents and half hopping from place to place in New Mexico, I was absolutely ready for some stability in my own place. And it has been great so far. I’ve been preparing for this move since getting back from last summer’s European adventures. Finding and getting into a PhD program was my main focus right up until the moment I was accepted back in March. After that, it was one big countdown until the next chapter in my life was ready to begin. And yes, my life chapters do happen to coincide with my academic life stages. I know a lot of you may have just graduated from undergrad, and it’s about time for the great grad student migration. Hopefully, since I made the move a little sooner than most, I can fill you in on what I’ve found to be most helpful during my transition. I started with a little research. First, checking out Rachel’s post from her move last summer, added a few other resources, and I deemed myself ready. disregard for your soon to be former room, right? Finding an apartment starting in June in a college town was a little challenging. Most leases run August-August, so my best bet was to find a summer sublet and then a more permanent situation. Searching remotely for apartments was a little frustrating, but I was able to ask around in my new department for advice. Remember, all of the other graduate students have already worked through these issues. They had valuable insight into where the best places to live were located. I used Craiglist to find possible locations, but ultimately it was talking directly to a potential landlord (instead of the subletter) that allowed me to find a place where I’d be covered for summer and all next year. Keep in mind you’ll have to pay rent and deposit up front, but your graduate stipend most likely will not kick in until a month after you start. Once you have a place secured, all you have to do is to move in. Sounds easy enough, right? Step One, figure out what need to get done in advance. I don’t have a car, so that meant finding and renting a moving truck. Inspired by Rachel’s AAA computer discount (editor’s note: Props to my Dad for being wise to the ways of discount shopping! ), I checked out the list of AAA member discounts. There were a lot more than I expected; I’ve been missing out. I ended up saving over $60 on the truck rental from Penske Auto. Next up, was to gather packing materials. I knew I didn’t want a stack of plastic bins taking up space in some closet or corner once I had arrived. Inspired by some of my research, I was able to fulfill all of my cardboard packing box needs in just one trip to my local Starbucks on their delivery day. I called ahead to find out what day they received shipments and inquired about acquiring their leftover boxes. Two relatively easy tasks, but getting them done quick and early helped me feel extra prepared. prepared me for this moment. As stressful as it may be, moving is still one of those nice reset opportunities. I’ve used mine as an opportunity to create a household where I can easily live an eco-conscious lifestyle, which means minimal plastic and buying new items. I have a wonderful collection of glass flip top jars for storing food that I got at thrift stores for about $3 each. Think about what sort of lifestyle you’d like to have and plan ahead. I’d recommend trying to get rid of/donate as many items as possible. Might I even suggest watching a few episodes of Hoarders to inspire you to purge some of your belongings? It’s seriously the best motivator for getting your clean on. Go through your closet and find items to donate. What doesn’t fit? What haven’t you worn? What shouldn’t you have worn? What’s been sitting around because you swear you’re going to alter or fix it? Let it go. That’s all less you’ll have to pack, haul, and unpack at a new location. Same goes for your other belongings. Pre- and post-move, I’ve keep a cardboard box in my room to chuck the stuff I’ve finally admitted I don’t need anymore. All ready to be unpacked! Honestly, once the moving van was completely packed, it was all downhill from there. The drive was long, but made easier by my collection of podcasts on the ready and a driving buddy who made sure I was clear to switch lanes when needed (essential when driving a 12 foot truck with all of your belongings). I made the brilliant decision of moving somewhere I already had a close friend (10/10 would recommend) so when it came time for unpacking in a new city, she provided some extra hands that lead to a swift unloading leaving more time for beers! Everything else seemed to fall into place smoothly. We had lined everything up in the living room area since it was the most central. My box labels ended up being less useful than anticipated, but it’s only a one bedroom apartment, so nothing was ever far away. I had been waiting so long to have my own place and the ability to decide where everything went, so I found unpacking went relatively quickly. I just puttered around from box to box, focusing on kitchen items first. Because, you know…food in my face reasons. Several items I was glad to have packed on the top layer within a box include: tissues, glasses for water, and toilet paper. I did, however, forget a can opener and shower curtain. Can’t win them all. How did your last move go? Any advice for all of the students that will be moving in August? We’d love to hear from you! 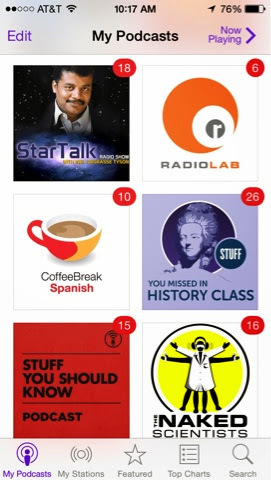 Screen capture from my list of podcasts! I’ve been out of the academic atmosphere for over a year now. Sometimes I just really miss getting my learn on. Academia pretty much ruled my entire life before I graduated with my MS degree (and it’s about to take back over! ), so you would think I’d enjoy a well deserved break from, well…thinking. But no, I missed it terribly and have found becoming an avid podcast listener to be one of my more enjoyable hobbies. I love that I have a nice little list of podcasts queued up on my phone, so whenever I find myself with an extra 20 minutes or so I can just hit play. There’s no decision making, which is really nice for someone as indecisive as I am. While I’m sure the internet has many sites for finding podcasts, iTunes is a great starting place. 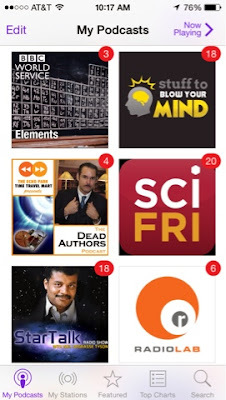 Their podcasts are collected, organized, and ranked, making it easy to browse categories of your interest and subscribe to those you’d like to have pushed to your device. Again, I always listen on my phone, but you can choose where to store your podcasts. I download a few episodes at a time when I’m around wi-fi so I don’t have to use up any cellular data. If you aren’t able to listen in this manner (maybe you don’t have a compatible phone/device) there are a few alternatives. Android users can use the Podkicker app. You can listen through iTunes on your PC. You could listen through a podcast website, such as Podcast Alley, from any computer. Several podcasts even have their own websites where you can listen. I have loads to listen to currently. I originally listened most of the time in the car. I often had 30 minute drives to/from schools when I substitute taught or between going to tutor the kiddos. However, now that I am about to settle down in Penn State sans car, there are plenty of other times I have been able to squeeze in a listen. People who conduct research often have simple, yet time consuming tasks to accomplish. Try listening to podcast or two while processing those samples or running those tests. I know a few runners that enjoy listening to podcasts while they go for a jog. 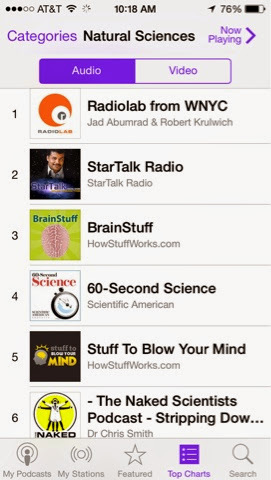 Really, most times you are listening to music you could switch to an informative podcast instead*! If you’re really trying to get your learn on in a shorter amount of time, you can always listen to podcasts on 1.5x speed and enjoy a slightly faster, more hilarious experience. When I first started storing podcasts on my phone I got very overwhelmed by all the options and episodes and those mocking red bubbles with the number of new episodes available! I actually ended up deleting and unsubscribing from everything for a while. I was spreading myself too thin. I can’t catch, errr, listen to ‘em all (editor’s note: Meridith’s geek girl side is one of my favorite things about her!). After this period of initial frustration, I went back and resubscribed to only a few podcasts, this time being much more selective. I also only focused on finding recent episodes that related to my interests. Then, I download these specific episodes so they are ready when I am! You want a few suggestions? Here are some of mine and Rachel’s favorite podcasts. Tell us your tale! Are you on the Podcast Bandwagon? Have any favorite ones (science or otherwise) that you’d like to recommend? Just checked out one of our recommendations and loved/hated it? Let us know in the comments! *I just turned off my music and turned on SciFri. Listening to my own advice!